Toki is a 1989 shoot 'em up platformer arcade game, or a "run and gun" developed and published in Japan by TAD Corporation and published in North America by Fabtek. It was designed by Akira Sakuma and features elements of tongue-in-cheek humor combined with the action. The player takes control of an enchanted ape who must battle hordes of jungle monsters with energy balls from his mouth (described humorously as "monkey-spit" or "monkey-vomit" by some gamers). The ultimate goal is to destroy the evil wizard who cast a spell on the title protagonist; therefore transforming him from an ape back into a human, and rescuing the kidnapped princess. The game was ported to several video game consoles and home computers. The game is a typical platformer in which the player must traverse several levels with a miniboss at the end. 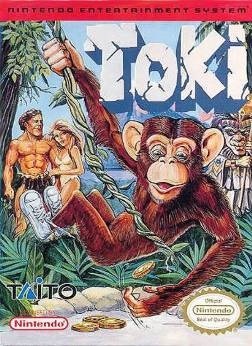 Despite his apparent handicap, his slowness as an ape, and the fact that almost any attack can kill him, Toki is able to spit powerful shots that will help him in defeating enemies and obstacles that try to slow him down in his mission. There is a timer for each stage. Toki can make use of items such as power-ups for his spit; lucky rabbit feet which can give Toki bursts of super-human agility and jumping skill; clocks which add extra time to the countdown; fruit which can add to Toki's bonus points; keys which unlock bonus areas; a special helmet that protects him from upwards attacks (the helmet rather comically resembles an American football helmet); extra lives; and magic coins (food in the Genesis version) which when collected in abundance can obtain Toki an extra life.